"We try to avoid the academic 'silo' effect," says Ursula Kelly (center). War—and the fear, violence, and death that come with it—often leaves wounds deep in the psyche that persist for a lifetime. Post-traumatic stress disorder (PTSD) among veterans is a well-documented and difficult to treat phenomenon. Female veterans, including those returning from Iraq and Afghanistan, often bring home psychic wounds of a different sort. Kelly, a psychiatric/mental health nurse practitioner with a nursing doctorate, came to Emory in 2009 from the University of North Carolina at Chapel Hill, where she studied issues of intimate partner violence among Latinas. “The broader scope of my research is PTSD related to interpersonal violence,” she says. 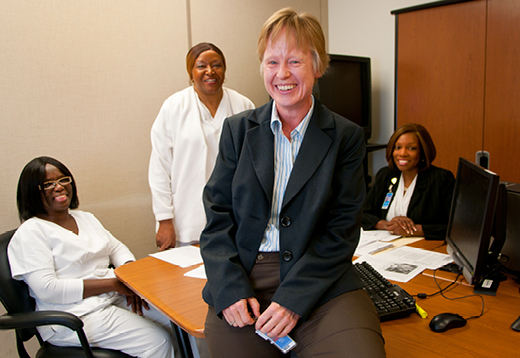 Before Kelly joined Emory, the VAMC had achieved Magnet status for high-quality nursing. During the Magnet evaluation process, the American Nurses Credentialing Center identified nursing research and evidence-based practice as areas for improvement. Kelly’s VAMC position was created in response. In addition toconducting her own research, she encourages nurses to seek research evidence to answer questions about clinical issues. She also teaches them to use their own ideas and clinical observations to formulate research questions. Nurses in the cardiac catheterization lab are working with an interdisciplinary, international research team to study patients’ awareness and brain changes during cardiac arrest. Another nurse recently implemented an evidence-based practice educational program for families caring for elders at home. Learning about the stark realities of caring for military veterans at the VAMC can be compelling for Emory nursing students, she notes. In her faculty role, she mentors BSN students in a professional development seminar that emphasizes social responsibility and service learning.